Beth Revis is a NY Times bestselling author with books available in more than 20 languages. Her next title, Give the Dark my Love, is a dark fantasy about love and death. It will be available this fall. 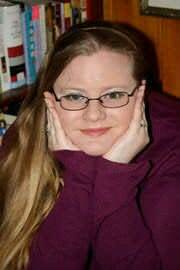 Beth’s other books include the bestselling science fiction trilogy, Across the Universe, and a novel in the Star Wars universe entitled Rebel Rising. She’s the author of two additional novels, numerous short stories,and the nonfiction Paper Hearts series, which aids aspiring writers. A native of North Carolina, Beth is currently working on a new novel for teens. She lives in rural NC with her boys: one husband, one son, and two massive dogs. "Diana Peterfreund's For Darkness Shows the Stars is an impassioned ode to Jane Austen, love, and the hope found in stars." "Absolutely brilliant. This is the sci fi Iâve been waiting for!" "You will not guess the ending to this unputdownable thriller full of lies, mystery, and unexpected twists!" "The Maze Runner meets Lost in this near-future sci-fi thriller that twists and turns all the way to the heart-pounding end!" "If the crew from Firefly somehow wound up as teenagers on the TARDIS and had to solve a Fringe-type mystery before time literally disappeared, you'd have something like Invictus." "Electrifying and unputdownable. There is no other book like this in the universe. It’s an honor (even among thieves) to share Zara’s spaceship with her." "Few understand the true horror that lies in the empty unknown of space, but Erin Bowman nails it in Contagion. Read this one with the lights on!" "I am physically angry that this is a work of fiction. If I'm ever murdered, please put Joe Biden on the case." "A book you will devour in one sitting, Hullmetal Girls is not to be missed!" "Cindy Pon's sci-fi debut envisions a world that could very easily become our own." "Les Miserables like you've never seen it before--this page-turning story rockets the classic through the stars and into your heart."